41/65 Kim Hollis It's an interesting documentary about a larger-than-life personality. This ESPN movie will be the first one to see a theatrical release in advance of its television debut. 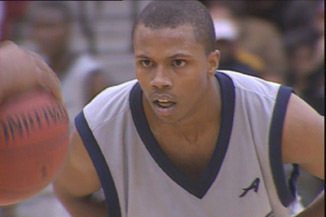 The story centers on Sebastian Telfair, cousin of New York Knicks player Stephon Marbury and brother of Providence College alum Jamel Thomas. From the tender age of nine, Telfair has been one of the best-known basketball players from New York City and has already become one of the hottest prospects out there. As he begins his senior year at Lincoln High School, his friend LeBron James is getting an NBA contract right out of high school and making an unprecedented $90 million sneaker deal. Although Sebastian has called a press conference to announce that he will attend college upon his graduation from high school, he soon wavers in that decision. He has lived in the public housing projects of Coney Island and spent 18 years in poverty. And when two men are shot in the hallway outside his apartment, Sebastian begins thinking that it would be better to get his family out of that area as quickly as possible. The means for doing so, of course, is making the jump directly from high school to the professional level - a jump that very few players have been able to pull off with great success.